The old Levine's clothing store building on Main Street in downtown Waterville occupied the space where Colby College wants to build a boutique hotel. The college has terminated its agreement with The Olympia Cos. to build the hotel and, instead, will develop the hotel property itself. 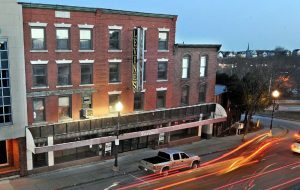 The old Levine’s clothing store building on Main Street in downtown Waterville occupied the space where Colby College wants to build a boutique hotel. The college has terminated its agreement with The Olympia Cos. to build the hotel and, instead, will develop the hotel property itself.